In chapter 11 of his Laws of Form, George Spencer Brown offers the notion of circuits as a way to interpret his calculus. He gives a few examples (p55 in the 2008 edition). 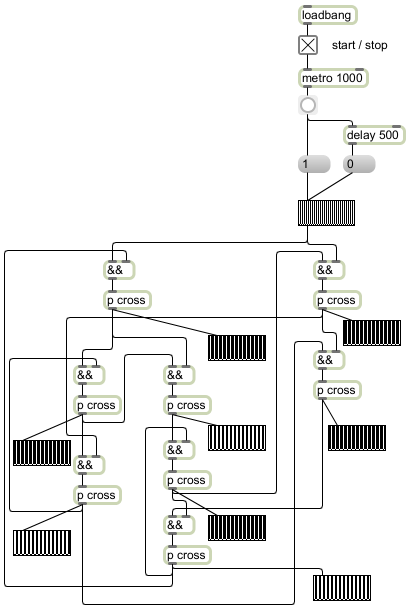 Using Max/MSP as the programming environment, it is rather simple to reproduce these circuits. There are two different circuits in the chapter, both of which essentially do the same thing: divide the frequency of a pulse by two. The circuit is built so that variable a changes between the marked and the unmarked state. The first example corresponds to arrangement E4 in chapter 11, while the second example operates with the imaginary state, thereby simplyfying the circuit. In the 2008 edition of the Laws of Form, Spencer Brown points out that the circuit can also work with four connections less than in the illustration, and asks the reader to find out which connections can be left out. The third example program presents a possible solution to this challenge. Finally, the fourth example program is even simpler, with fewer connections than the other examples. However, this program seems to work profoundly different than Spencer Brown’s examples, and it does not keep the calculation’s phase as they do. This entry was posted in coding, Science on March 6, 2010 by fgrote.